The Dominican Republic is located on the island of Hispaniola in the Carribean Sea. The country of Haiti occupies the western portion of the island and the Dominican Republic is on the eastern side. Amber is mined in the Dominican Republic in the Cordillera Septentrional mountains north of Santiago and in the Cordillera Oriental mountains north of Santo Domingo. 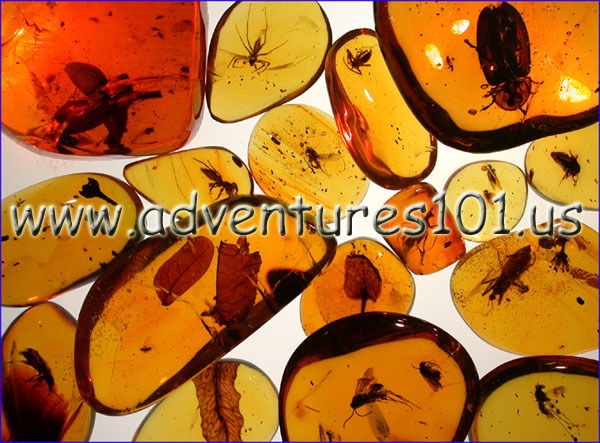 Most of the Dominican Republic amber comes from a small group of mines located north of Santiago at an elevation of about 1500 feet above sea level. The Palo Alto group of mines is pictured below. Landslides on steep mountain slopes expose lignitic sandstone veins where tunnels and broad pits are sunk to find amber. If you look closely you can see the parallel lignite viens exposed in the image below. Tunnels following rich veins of amber can be several hundred feet long, extending deep into the mountain slopes. These tunnels are dangerous, they are essentially not supported and can collapse when they fill with water during the rainy season. The world renowned La Toca group of mines is located along a ridge of mountains to the northeast of Santiago. Currently excavations at the La Toca group have all but stopped, but in it's prime La Toca was home to over 200 miners. Off to the mines and welcome to the jungle. Excavating amber in tunnels is hard work and very sweaty, but rich amber veins can yield several pounds of amber in one day. Only a few miners work in a tunnel at one time, but gathered outside is always a large group of miners. Miners use candles as their light source in the tunnels, holding up newly excavated pieces of amber to them, to reveal any large inclusions. Tailings from inside of the tunnel are placed in burlap bags or feed bags and dragged outside of the mine where they are dumped in large piles and inspected for any wayward pieces of amber. All the sweat and the mud is well worth the effort when some particular nice gemstones are found. And at the end of the day, it's always nice to go home and enjoy a cool large drink.